On National Puppy Day, we've seen tons of people sharing pictures of themselves with their puppies/grown up dogs. But Twitter user @USCocksman and editor of BarkingCarnival.com, shared something that literally caught the attention of thousands. 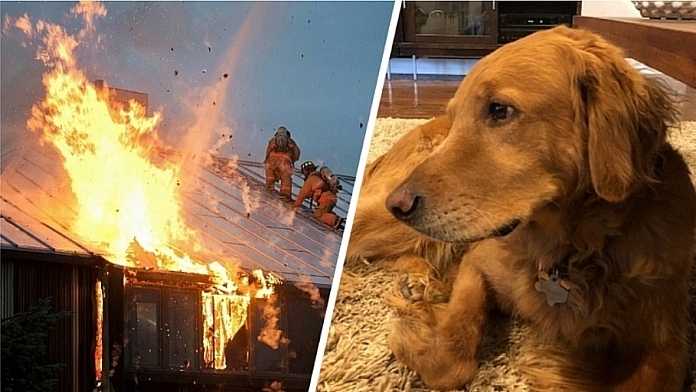 He shared his story, about how his dog Hank literally barked up a storm to save his family from a huge fire. He created the twitter thread which got shared by thousands and is still getting a lot of traction. My wife got a reminder yesterday that 6 years ago Hank ate her brand new slip on Vans. Look at that guilty pup. Come on, Hank. So I dragged myself off the couch and went out to the living room to make him stop. As soon as I came around the corner, I saw that the entire yard was glowing orange. The very large wooden work shed full of gasoline, paint and God knows what else was blazing. The oaks were on fire. Flaming leaves and embers were blowing everywhere. The firefighters were absolutely amazing. It was windy, so they had to contain and deal with this for two adjacent blocks. Just totally, unbelievably skilled and coordinated. This story is the whole point of Twitter. What a beautiful brace beautiful dog it's amazing what they do for us humans my girl knows when I'm going into a fit & gets help, amazing !! My daughter's home burned today too. They weren't home, but the kitty was. Firefighters saved her. Doggos and firefighters are indeed our guardian angels. So glad I saw this today, of all days. Hank is a hero. We don’t deserve dogs. A real hero Glad to hear that everyone is safe and that the house is still intact. Dogs are amazing, eventhough they don't always act like we'd like them to act, in the end they would do everything for their owners. Well done Hank! Thank you so much for sharing your story. Our pets really are our family and they sure they're loyalty in a myriad of ways. Good dog Hank!!! Thank you for sharing your story. Hank is an awesome part of your family!